I bought this years ago, sight unseen, on Japanese laserdisc and have only just discovered what the film is actually called, thanks to an extract from Patrick Macias' book Tokyoscope. 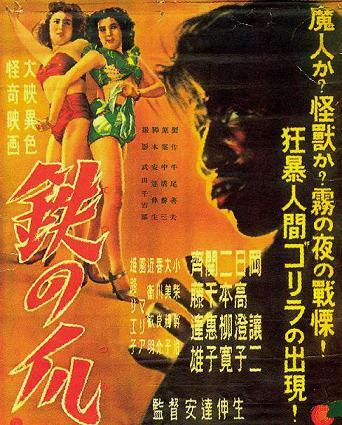 His book is a rare look at cult Japanese cinema. 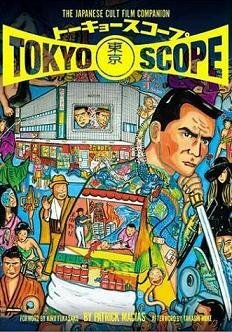 Where most English-language books only look at Kurosawa or Godzilla, Patrick has opened up the subject on the sort of cult films that I love, and reviewed them in an informative and amusing way. The review is recommended - see here. Caught somewhere between Hollywood's The Wolf Man (1940) and Hammer's Curse of the Werewolf (1960), mixed up with Dr Jekyll and Mr Hyde and King Kong, the result is unique, and not altogether unsuccessful! A series of murders occurs near a nightclub and a local church. The list of subjects include meek church worker, Tashiro, who seems to act strangely around palm trees and bottles of alcohol. He's also torn between his love of the church organist and a nightclub dancer (much like Spencer Tracy in his portrayal of a drunken Mr Hyde in 1941). Tashiro's schizophrenic life is physically accentuated by a bite he received from a wild ape in the jungle during the war. Whenever he drinks excessively, he transforms into a beast-man (don't we all). Yes, instead of Dr Jekyll's potion, all he needs is alcohol to help the badly-behaved beast emerge. A lowlife drinking buddy decides to exploit his curious talent for transformation into an act at the local theatre! This turns out to be quite a night. The opener is a singing act in a glass cabinet. She magically changes her clothes whenever electricity is arced across the case (how is that possible? why would you do that?). For the star turn, Tashiro comes on stage, sits down and drinks. Not very entertaining (unless you like plays by Beckett), until eventually his face becomes bestial, using a similar effect to Murnau's Dr Jekyll and Hyde (1931) where a change in the colour of the lighting reveals his monster make-up. 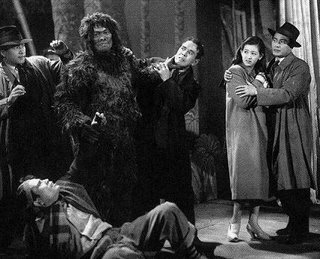 Tashiro then ducks behind some jungle scenery and obediently changes into a gorilla costume, presumably to illustrate his wartime experience to the audience. Of course, things go wrong, Tashiro rampages down to the local nightclub, spectacularly wrecks it, steals a dancer and heads for the rooftops with his trophy (like all apemen before him, from Murders in the Rue Morgue to King Kong - it must be genetic). But I'm telling you the plot! Of course I won't spoil the ending, but strangely, it features the church bell, much like the climax of Curse of the Werewolf. In this genre, coincidence seems to be rife. The earnest acting and moody photography (palm trees have never looked so forboding) are undermined by the inept monster make-up that's eventually revealed. Beast-man in close-up looks like a bad Halloween make-up kit, including the comedy bad teeth. But in wide shots, the ape suit looks good, and the nimble stunts that exploit his animal traits, like clearing a fence and leaping up to a balcony, are cleverly done. The film is nothing spectacular to rave about, but like the Hollywood monster movies of the forties, I think it has a sustained watchable charm - it's certainly a unique mixture of several horror genres and is a far better production than many of the ape movies widely available in the US. It's also unusual that the apeman isn't used here for comedy value. I'm sure this film would find an audience, if only it was released with a translated soundtrack or subtitles. At present I don't believe it's available on any video format, certainly not Japanese DVD, and never had a US release. Actor Joji Oka plays Tashiro, the director is Shinsei Adachi, and IMDB lists this film only under the name Tetsu no Tsume. I just wanted you to know about it.